If you've had periodontal (gum) disease, you've no doubt experienced gum inflammation, bleeding or pain. 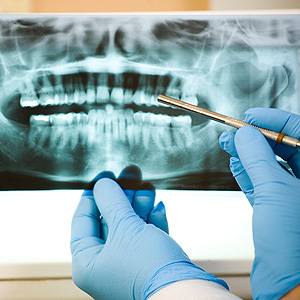 But your gums may not be the only mouth structures under assault — the disease may be damaging the underlying support bone. Although easing soft tissue symptoms is important, our primary focus is to protect all your teeth's supporting structures — the gums, the attaching ligaments and, of course, the bone. To do so we must stop the infection and reduce the risk of reoccurrence. Stopping gum disease depends on removing its source — plaque, a thin biofilm of bacteria and food particles accumulating on tooth surfaces, due to poor oral hygiene. We must remove it mechanically — with hand instruments known as scalers or ultrasonic equipment that vibrates the plaque and calculus (hardened plaque deposits) loose. It's not always a straightforward matter, though, especially if the diseased gum tissues have pulled away from the teeth. The slight natural gap between teeth can widen into voids known as periodontal pockets; they fill with infection and can extend several millimeters below the gum line. We must thoroughly cleanse these pockets, sometimes with invasive techniques like root planing (removing plaque from the roots) or surgical access. You may also need tissue grafting to regenerate gum attachment to the teeth. One of the more difficult scenarios involves pockets where roots divide, known as furcations. This can cause cave-like voids of bone loss. Unless we treat it, the continuing bone loss will eventually lead to tooth loss. Besides plaque removal, it may also be prudent in these cases to use antimicrobial products (such as a mouthrinse with chlorhexidine) or antibiotics like tetracycline to reduce bacterial growth. Perhaps the most important factor is what happens after treatment. To maintain gum health and reduce the chances of re-infection, you'll need to practice diligent daily hygiene, including brushing, flossing and any prescribed rinses. You should also keep up a regular schedule of office cleanings and checkups, sometimes more than twice a year depending on your degree of disease.